HARTFORD –Today, U.S. 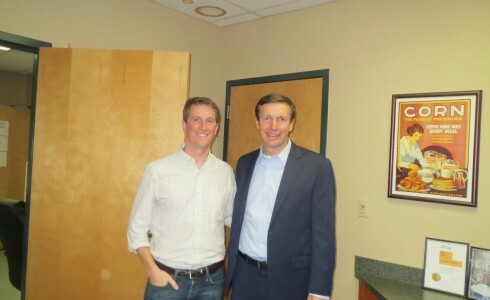 Senator Chris Murphy (D-Conn.) launched a new weekly series called “Murphy’s Monday Manufacturer”, in which one of Connecticut’s distinct manufacturers will be recognized for their outstanding contributions to the state. The manufacturing industry plays a crucial role throughout Connecticut communities, creating new jobs and accelerating our state’s economic recovery. Today, Connecticut’s 4,602 manufacturers account for 10.2% of the state’s jobs and 87% of the state’s total exports. In order to protect and grow manufacturing jobs in Connecticut, Murphy has introduced two pieces of legislation that aim to strengthen existing standards and prioritize the purchase of American-made goods, the 21st Century Buy American Act and the American Jobs Matter Act. This week, Murphy is recognizing Severance Foods, Inc. for their hard work and contributions to Connecticut’s manufacturing industry. Located in Hartford’s North End, Severance Foods, Inc. has operated out of Connecticut for their entire 30 years of business. At the company’s inception in 1984, the three-person company operated out of a 7,500 square foot building. The manufacturer has expanded exponentially in size, and today, Severance Foods, Inc. employs 90 of Connecticut’s devoted workforce out of four buildings and 80,000 square feet. Severance Foods, Inc. is the largest manufacturer and co-packer of tortilla chips in the Northeast, producing over 25 brands located nationally and internationally. The company even created their own brand, Pan De Oro, which is sold throughout the Northeast. Business for Severance Foods, Inc. has increased by more than 80 percent in the last six years, and the company currently brings in $18 million in revenues annually. “Connecticut is lucky to have the commitment and loyalty of Severance Foods, Inc. Not only should we thank them for their addicting and delicious tortilla chips, but we should also recognize them for employing Connecticut workers in high-quality and well-paid positions. Severance is growing by the week, and that’s good news for their workers, Hartford, and the state. I’m proud to recognize Severance Foods, Inc. as Murphy’s Monday Manufacturer,” said Murphy. “Connecticut has been a good location to grow our business with proximity to major markets for our products. But more important is our dedicated and motivated workforce here in Connecticut that has been the basis of our ability to produce quality products for the past 30 years,” said Richard Stevens, President of Severance Foods, Inc.